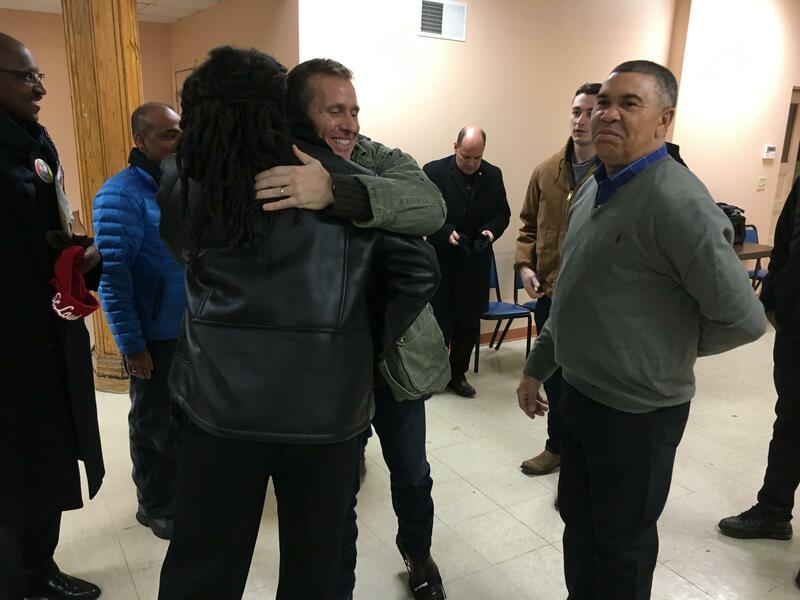 Missouri Gov.-elect Eric Greitens hugs Rev. Ken McKoy, a pastor with Progressive Zion A.M.E. Church. 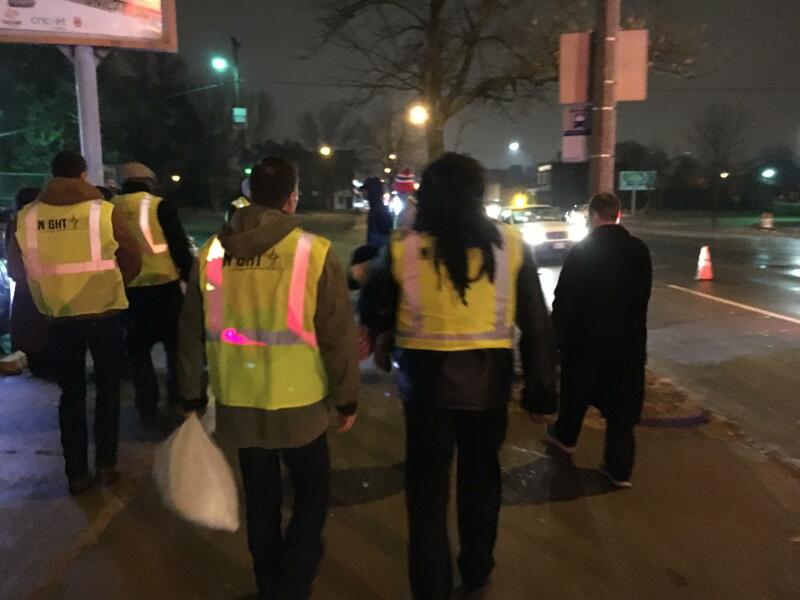 Greitens walked with McKoy as part of NightLIFE, a group that seeks to curb violence in north St. Louis neighborhoods. U.S. Rep. Lacy Clay is looking on. Greitens made public safety a big part of his successful campaign, with an emphasis on vigorous support for law enforcement. But after he helped hand out blankets, bottled water and sandwiches to a man near a car, Greitens said the task at hand is about more than just arresting people and throwing them in jail. It’s about dealing with deep-seated deficiencies in education and economic development, and historical racial divisions. As the first governor in decades to come into office after living in St. Louis, Greitens doesn't have to look that far to see the poverty and crime that afflict his city. Just after he won his election, his wife was the victim of an armed robbery. That event prompted him to declare "if we continue down our current path, it will continue to lead to more disorder, more lawlessness, more chaos, people living farther and farther apart from each other divided by fear." Some political and religious leaders in this heavily Democratic city are willing to give the GOP official a chance. 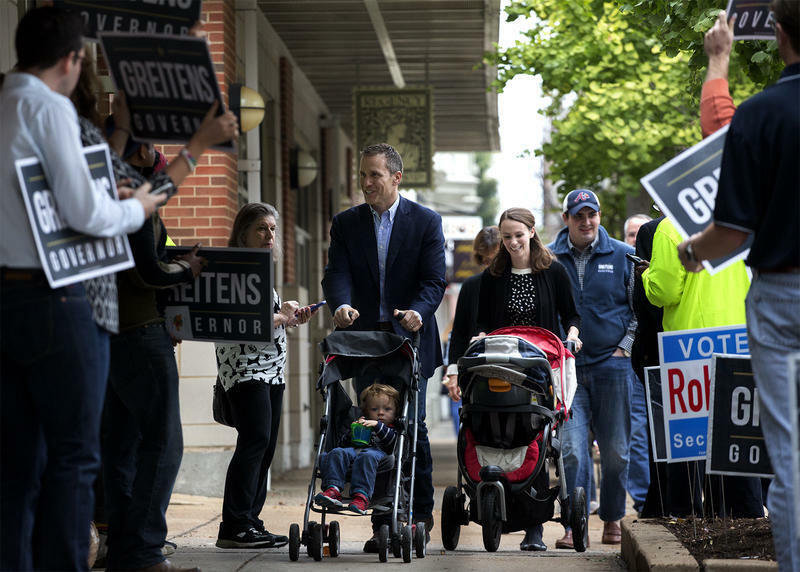 Others, though, feel Greitens’ status as a city dweller doesn’t matter as much as the policies he pursues. St. Louis is heavily Democratic – as evidenced by the fact that Greitens received only 16.3 percent of the vote in the city. But officeholders from St. Louis such as Sen. Jamilah Nasheed say Greitens may have a better understanding of St. Louis’ problems than people realize. U.S. Rep. Lacy Clay said he has had a relationship with Greitens for years. The University City Democrat, who used to live in the Skinker-DeBaliviere neighborhood, said Greitens often helped explain the value of the military to young constituents who were interested in going to service academies. Before he joined Greitens on the NightLIFE walk, Clay expressed optimism that he could work with the new governor. 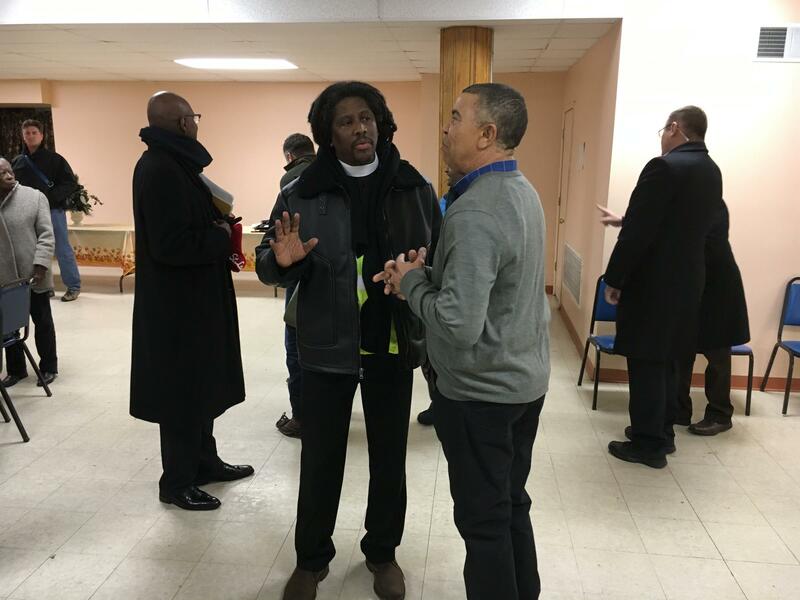 In answering questions from a crowd gathered at Wayman A.M.E. Church, the two promised to work together on economic development projects and drug treatment programs. They also heard from people whose family members had been shot and killed. Ken McKoy is pastor at Progressive Zion AME Church who helped found NightLIFE. Even though he said he was generally leery of politicians, McKoy developed a relationship with Greitens during the campaign – and was impressed by the then-candidate’s candor and willingness to help young people turn away from violence. One of the reasons for McKoy’s "cart before the horse" comment is that he possesses profound differences with Greitens on some issues. Rev. Ken McKoy, left, speaks to U.S. Rep. Lacy Clay on Friday. In response, Greitens, who prominently showcased his advocacy for the Second Amendment during the primary campaign, contended stricter gun laws weren’t effective in other cities. The above audio clip features Ken McKoy asking Eric Greitens about what he will do to get guns off the streets in St. Louis. When Rev. 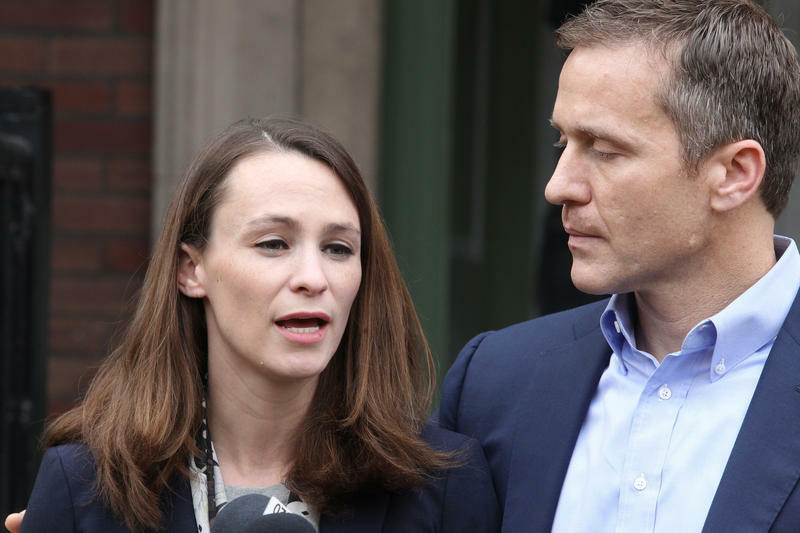 Christine Stancil asked if he thought expanding Medicaid could be part of any violence-prevention effort, Greitens reiterated his opposition to such a move – citing high price tags in other states. Greitens answers a question on Friday about Medicaid expansion. These exchanges hit on a key point: Even if Greitens understands the issues in Missouri’s big cities, it doesn’t mean he’s going to embrace policy positions that are popular with local elected officials or city residents. And even if Greitens did agree with expanding Medicaid or restricting firearms, those proposals wouldn’t gain a lot of traction in a Missouri General Assembly that Republicans dominate. Back on the frozen streets, Greitens said he isn’t surprised that St. Louis residents differ with his politics at times. But he added he’s willing to work with people who disagree with him – especially to deal with tough, St. Louis-centric issues. Greitens and McKoy walk along Kingshighway on Friday night. Greitens added that building relationships with community leaders like McKoy is crucial. He went onto say that fighting violence, though, will take more than just a stronger policy presence. 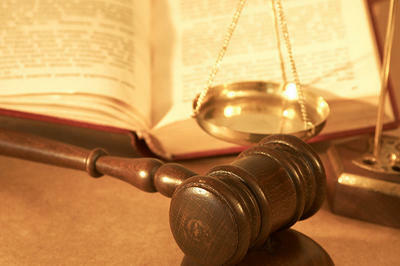 It will take hunkering down and formulating the right type of public policy. This article first appeared in the St. Louis Beacon: A minister and a civil rights group are credited with pulling together what’s being described as the first city-county effort to focus on addressing crime, building trust and reducing conflict among young people, and improving the quality of life in underserved communities. 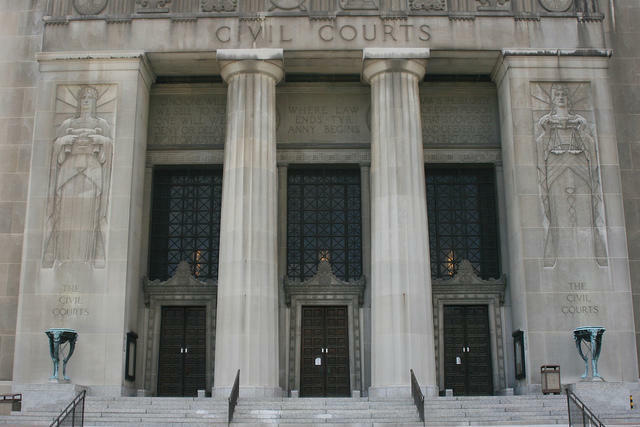 Both prosecutors and defense attorneys in St. Louis are applauding an appeals court ruling outlining what information must be provided to defense attorneys in criminal trials.